The reserve comprises a peninsula and several islets in the northwest coast of Corsica. The reserve (1000 ha) has a complex topography and deep bottoms offering a wide range of habitats for species development. The biota has a number of special features. 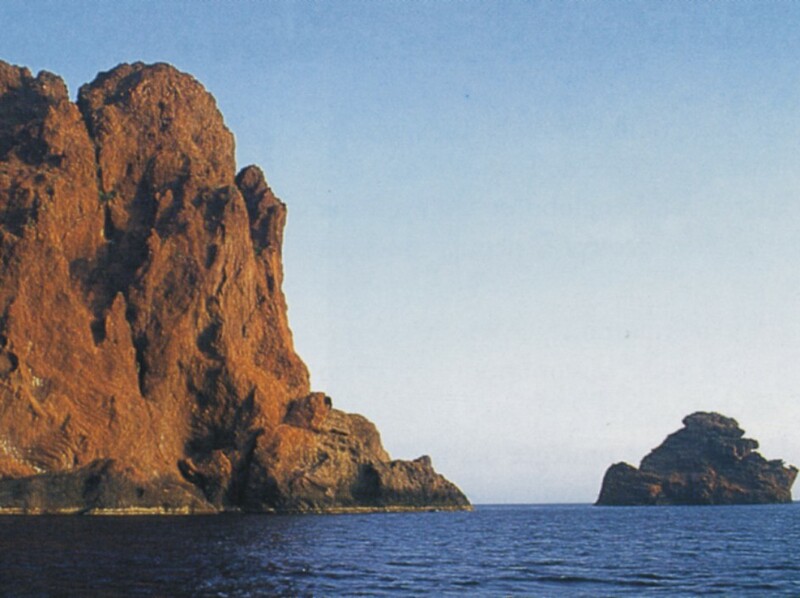 Several Mediterranean species are found at Scandola and nowhere else in France. A lot of marine species regarded as ‘rare’ and ‘scarce’ in the Western Mediterranean Basin are present. The Scandola marine fauna and flora has received attention from professional collectors and recorders over the past century. Comprehensive inventories and studies of many components of the biota have been published, most of them in “Travaux Scientifique du Parc Naturel Régional et des Réserves de Corse”: these include macroalgae, Cnidaria (Corallium rubrum), Trematoda, Digenea, Mollusca, Echinodermata, and Euchordata (fishes, birds, mammals). In addition, there are more than 150 other publications relating specifically to the biodiversity or natural environment of Scandola. The “Parc Naturel Régional de Corse” has initiated regular monitoring programmes for the rocky and soft substrate communities, seagrass beds, vagile fauna and human activities (fishing and tourism). Located very far of urban agglomerations and industries, the Réserve Naturelle de Scandola is free of direct anthropogenic perturbations. Fishing, main source of stress in the region, has a limited impact since they are not allowed in the part of Reserve (Réserve intégrale: zone with reinforced protection, professional fishing prohibited) and limited in the rest of Reserve. Angling and Scuba diving is prohibited in all the Reserve. Snorkelling is allowed. Mooring must not exceed 24 hours. There is no industrial pollution, mining, dumping, dredging, or potentially harmful agricultural runoff. There is no resident population. The Natural Reserve is subdivided in two parts: one part with limited protection (Professional fishing with dispensation) and one part with complete protection (no fishing and no SCUBA diving). Snorkelling is allowed in all the Reserve. Mooring must not exceed 24 hours. The Reserve is only accessible by boat. All sites can be reached from Galeria, in the north and Porto, in the south. The small boat of the Reserve staff is capable of all normal requirements for biodiversity work and may be hired for working on the coastal shore and offshore. The distance from the protected area to the small field research laboratory of the Reserve (microscopy, SCUBA diving equipments, compressor, accommodations for 4 researchers) in Galeria is approximately 9 km ‘as the crow flies’, and normally takes about 1 hour. There is no laboratory on the Reserve. The facilities for SCUBA diving are comprehensive. Two fully qualified operators offer all facilities: dive-boat, equipment, compressor, and local knowledge of dive-sites. All forms of housing, ranging from self-catering cottages to hotels, are available. Most hotels close in winter. Records and inventories of marine species belonging to studied groups are available as hard-copies (reviews), and in EXCEL and WORLD versions for specialists. This includes data on names, habitat type, collectors, dates etc. Some informations about the “Parc Naturel Régional Corse” and the Natural Reserve of Scandola can be obtained via the website http://www.parc-naturel-corse.com/. Scandola is a major focus for different national and international programmes of biodiversity research. The “Parc Naturel Régional de Corse” and its Reserve staff have statutory responsibility for surveying and monitoring the marine and land biota of Scandola. Several scientific teams spend a significant proportion of their time on this research, and in addition there are numerous sub-contractors and students also undertaking marine biological work in the Reserve. The “Parc Naturel Régional Corse” has established a scientific plan of management and there is a specifically allocated budget for biodiversity work on the Natural Reserve of Scandola. All scientific projects ought to be submitted to the Scientific Committee of the Reserve for valuation and authorization.